Welcome to the wacky world of button football. Brazil is just as much a powerhouse in this form of the beautiful game as the regular kind played on a field. The ball goes right over the defenders and into the corner of the net. Goal for Zidane! Well, at least a goal for a little plastic disk with the French football legend’s name on it. A boy plays button football in Brazil. 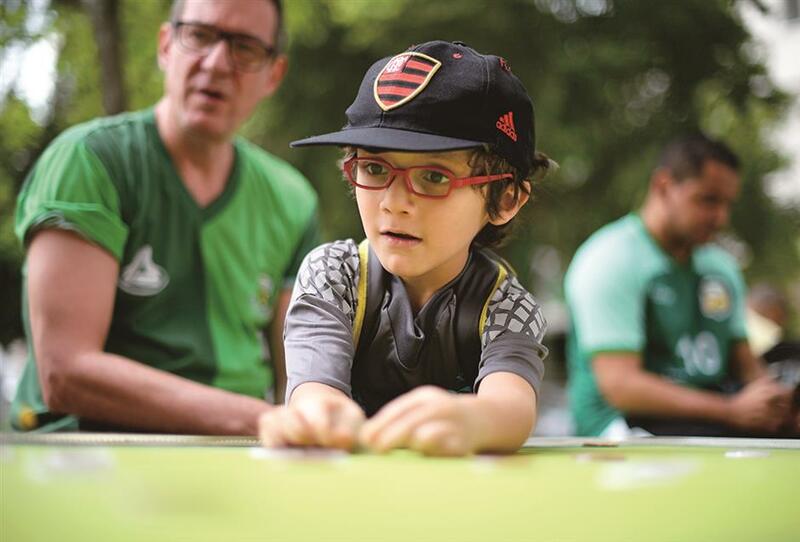 Every weekend, 20 to 30 players meet in Rio de Janeiro to play with customized buttons, inspired by teams around the world. Players stand at a table, each with a team of 11 plastic disks about the size of poker chips. Competitors then take turns to use a separate piece, shaped like a guitar pick, to flick their players, which then strike a small ball around the field. The result can be engrossing, involving tactics, luck and no doubt a few stars. Alexandre Cerqueira Gil, who was playing “Zinedine Zidane,” goes every Saturday morning to meet fellow button football aficionados for pick-up games in Rio de Janeiro’s atmospheric Sao Salvador square. “We manage to recreate most of the situations you get in football,” said Gil, a 54-year-old lawyer. A man on a button football pitch plans a strategic move in a game. The game is played all over Brazil, as well as in a handful of other countries, but regional variations are common, meaning it can be surprisingly tricky to master. In Rio, for example, players stick to what they call the 9x3 rule. Games last 14 minutes in two halves and the players take turns to flick the ball nine times, but only three times in a row with the same player. Guarding the goal is a keeper in the form of a rectangular block, taking up about two thirds of the area of the net. Scoring isn’t easy. Originally, buttons taken from clothing were used for the players. But the tokens have evolved into specially made pieces decorated with the colors of football clubs from all over the world. Often they also carry the names or numbers of players, allowing enthusiasts to recreate legendary teams, or put stars from different eras side by side. Some will enjoy having Neymar alongside Pele, for example, but purists say that a real button football team should be based on actual teams. A complete game set costs around 180 reais (US$48). Button football plastic disks carefully protected in a see-through plastic bag. 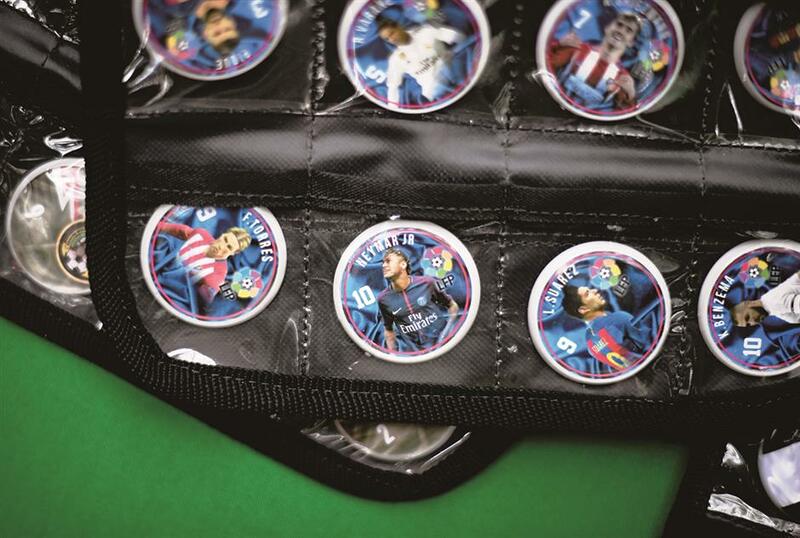 Originally buttons taken from clothing, the tokens have evolved into specially made pieces decorated with the colors of football clubs from all over the world. A true aficionado, Gil said he has collected disks for around 80 teams. “I have buttons made of acrylic but also some made from coconut or the old tokens that we used to have on buses,” he said. When competing, he favors his real-life favorite team, Rio club Flamengo, with the player representing his idol Zico in a prominent position. He sometimes uses Real Madrid with Zidane during his playing days. “I’ve played since I was 4. My father taught me. When I was small, all I thought about was winning, but what I like better here is seeing my friends,” Gil said. 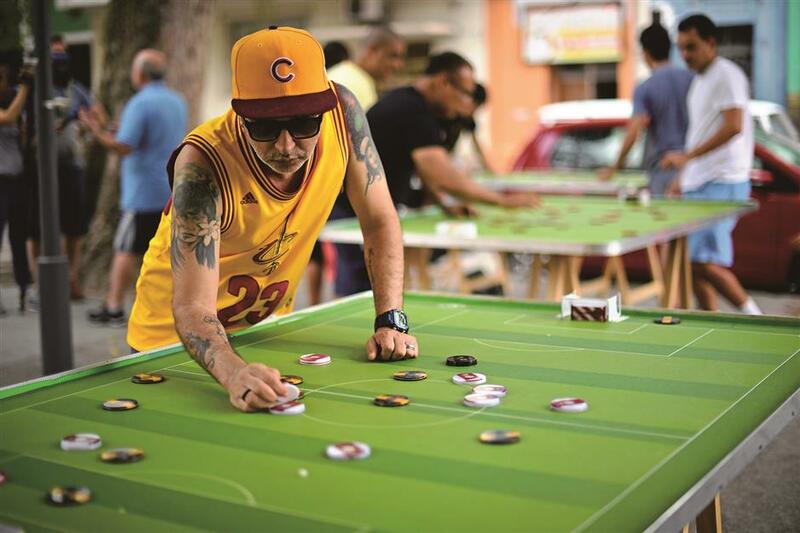 Joao Carlos da Silva Nunes, 59, is an experienced player, who was chosen to play a button version of the World Cup in a Rio shopping center. Just like the real World Cup in Russia, the tournament will start on June 14 and end on July 15. Da Silva Nunes will be playing the “Senegal” team. Unlike in real football, though, the button version won’t come down to the usual suspects like Brazil and Germany in the semi-finals. At the last contest, held in 2014, real-world footballing minnows Honduras came out on top.